Download E-Maps 14 day trial – Test it for free! 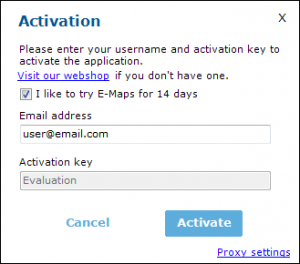 Activate E-Maps with your e-mail. We may use your mail to inform you about our products. Read here our License Agreement. Download Excel E-Maps and test the full functionality during two weeks. In the trial version, the number of addresses that can be geocoded (plotted) on the map is limited to 2.000 on a map and 5.000 in total for the trial period. If you create maps based on X and Y coordinates in Lat/Long or popular visualization, the limit is not applicable. Having problems using the self extracting executable? Download E-Maps_Installers.zip (71 MB), extract the files to your computer and then run setup.exe. After installation of Excel E-Maps, you only have to enter your email address in the menu. Then you can use E-Maps for 14 days. The license code for the full version of E-Maps is for sale in our webshop.